While in Denver for a short trip a couple weeks ago, I spent a few hours at the Denver Art Museum. They have this artwork displayed in a rather odd place—a wide corridor that connects their two main buildings. You could easily miss it, except it’s a Keith Haring, and Keith Haring tends to draw attention. Haring made nine editions of this cast-bronze sculpture shortly before his death in 1990. A firsthand account of its making, written by Sam Havadtoy, has become the primary way that this artwork is popularly understood. If you’re curious, you can find it here. Obviously, there is lots of Christian iconography here. The viewer is immediately drawn to the baby in the middle of the center panel, presumably an infant Jesus in the arms of Mary. But the figure that extends up is also vaguely trinitarian–the many arms suggesting the omnipotence of God. The topmost pair echo the arms of the cross, and the head seems to look down. The short lines surrounding this figure convey a sense of energy. 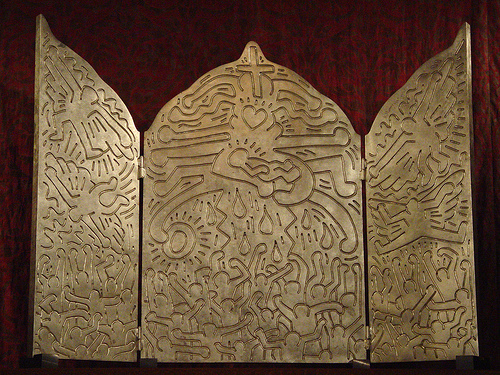 On the left and right panels, Haring drew four winged creatures. Havadtoy described them as an image of a fallen angel (the Fall) and the resurrection (Christ’s victory). The people crowded below seem to dance, swoon, and reach up to heaven. So, as far as I can tell, this is usually interpreted as a reflection on—if not an affirmation of—the sacred. I get that. Haring does express Christian theology about salvation in a rather tidy and compelling image. But, there’s another way to read this—as a personal reflection on his own impending death. When he drew so-called “radiant babies” before, he was connoting a range of things—sometimes Jesus, but also all of humanity and even himself. The main figure–an all-powerful, loving, tender God– cradles this little baby. Could Haring have imagined himself being held by God as he prepared for his own death? Could he have been contemplating how, despite his own sin, eternal life might be possible because of God’s love for him? I don’t know. After a protestant upbringing and an affiliation with the Jesus Movement, he spent much of his short adult life being skeptical about religion and the church. He did come back around to Christianity, apparently, so it’s conceivable that he would do such an overtly theological artwork—especially when drawing on a triptych shaped like an altarpiece—but it is less clear if he would have endeavored a personal reflection on his own salvation. But does it really matter? Haring understood how language and symbolism work. An author/artist uses a series of words/symbols to send a message, but the receiver might hear/read a different message because they understand the words and symbols differently. Ambiguity is part of the game of communication. So, he carves these symbols into clay and they are cast into bronze. The message is sent. I feel the need for a big dose of theology today. Lucas Cranach the Elder will do it. In fact, where do we start? This painting could be a visual treatise on the doctrine of salvation—with a Reformation emphasis on salvation by grace for all who believe. Very simply, John the Baptist (the third man from the right) points up to the crucified Christ to indicate that one only needs to look up to Christ to be saved. That’s grace. This simple message is repeated and expanded throughout the rest of the image. In the background, for example, the scene with all the tents shows the story from the Old Testament (Numbers 21) when God’s people spoke against God and he rebuked them by sending poisonous snakes. Moses called out to God on their behalf and God told him to make a bronze snake and put it on a pole so anyone who was bitten could look up to it and live. He did and they were. In other words, they could be saved by merely looking up to the symbol of God’s power and grace. It’s an Old Testament prefiguration of the crucifixion—when Christ is put up on a pole and people are saved by looking to him. Here, that connection is made obvious because both John the Baptist and Moses point up—LOOK UP and LIVE! Others look up in the background. Right beside all the tents is the scene from the gospel of Luke when an angel appeared to the shepherds after Jesus was born and told them, “Today … a Savior has been born to you!” Instead of announcing the Messiah’s birth to religious folk who would seem to be the most deserving, God chose to tell those who would appear to be the least deserving of all. Grace again. Back to the foreground, John the Baptist not only gestures up, but also points downward to the sheep. This references the gospel story when John saw Jesus coming and declared, “Behold, the Lamb of God, who takes away the sins of the world!” It’s an astonishing thing to claim. When sin became a prominent aspect of human nature (it didn’t take long), God instituted a religious practice that included sacrificing animals to acknowledge one’s wrong-doing and “cover it,” at least temporarily. Because sin is perpetual, the sacrifices were too. But John seemed to know immediately that Jesus would become an ultimate sacrifice—just like the animals, he would die, but this sacrifice would be complete, permanent, and inclusive. In Christian theology, one only has to accept his sacrifice in order for it to be the ultimate sacrifice. Thus, LOOK UP and be forgiven … be saved. Cranach seems to want to emphasis that we are saved by grace and not by simply being good, for he tucks a counter example behind the cross. There we see a nearly naked man, who symbolizes humanity, being chased into hell (the flames) by Satan (the monstrous figure) and Death (the skeleton). He’s destined to burn not because he’s been bad, exactly, but because he has tried so hard to live by the law (here upheld by members of the clergy and Moses himself). The point: If you seek salvation by being a good person, it just ain’t gonna work because no matter how hard you try, you’re going to screw up, which, according to the law, means death. Try to live by the law, you’re going to die by the law. The alternative? Look up to Christ. If you do, you will not only be saved from eternal damnation, but you will witness victory over sin and death. That’s the resurrected Christ on the left trampling Death and Sin. Needless to say, you want to be on his side. Up to this point, the bits of iconography are pretty standard. But then we get to the two men on the right. The one on the outside is none other than Martin Luther. He points to an open book which has three biblical passages from his own German translation of the Bible—I John 1:7b, Hebrews 4:16, and John 3:14-15)—which point to the various themes of the painting and underscore the main point. Believe that Christ’s sacrifice saves you and it will. The man with the white beard is Lucas Cranach the Elder himself. Apparently, the painting was finished by Lucas Cranach the Younger, so I’m not sure if this should be considered a self-portrait or a commemorative portrait. Either way, the important thing is the stream of blood that gushes from Jesus’ side and splashes on top of Cranach’s head. While somewhat gruesome, Cranach testifies here that he has allowed the blood of Christ to “cleanse him from all sin” (I John 1:7). His faith has saved him. Interesting … he doesn’t actually look up to Christ, even though that seems to be such an important message in this painting. Instead, he looks out at us directly. Making eye contact, it is almost as if he is pleading with the viewer to take all of this seriously, maybe even follow his example. Look up, believe, and be saved. I’m Protestant by habit, so the churches I’ve gone to don’t have crucifixes, they have empty crosses. I was told that this (a) prevents us from idolatry (no praying to a craved god, even if it is Jesus) and (b) allows us to celebrate the empty cross, the risen Christ. Okay, fine. But I am a little jealous of my Catholic friends who can practice looking up to the crucified Christ every time they go to church. That seems important. Maybe I’ll head over to Saint Al’s this week. I thought I was going to write about something Medieval-y, but this is all I got today. This painting is so simple. Your attention is first drawn to the mother and child because their skin (and the child’s shirt) are so light in contrast to the dark areas that surround them. And, their skin is smooth and soft, while the rest of the room is more variegated and textured. Your eye then glides along the slight decline of their bodies, and then follows the white line formed by her stocking and underskirt down and back until it rests with the pool of fabric on the floor. The weight of that velvet pulls the whole painting down, conveying and even evoking that feeling of heaviness we sometimes have when falling to sleep. It seems like the painter wanted this effect because the underpainting that is visible through the mound of fabric on the left suggests that he added that extra cloth rather late in the process, perhaps to add more weight to the dress and thus to the painting. Now, I normally don’t go in for 19th century academic painting. It’s a little too aestheticized and vacuous for me. But today I’m really tired and feeling empty myself, so this one touches a chord. I need sleep. But sleep is a luxury. I’ve been feeling so guilty lately. I’ve been investing so little into my spiritual life. Shouldn’t I be getting up early to read a psalm or something? Shouldn’t I be praying more? Shouldn’t I at least be going to church every week? But the reality is that I’m so exhausted, so stretched thin, so spent, that it seems like there’s nothing left for nurturing a spiritual life. Nothing. So I look at this painting, and I feel my whole body get heavy. My soul too. I am pulled downward. But it’s not a free-fall, not even a slow one, for I feel the firmness of the pillow and cushions pushing up on me. The slow drop is inside. Like something folding in on itself. My soul falling back into the bottom of a deep exhale. I get it. God is calling me into sleep. I’ve long since believed that God ministers to us while we’re sleeping. I just forgot that … until tonight. Thanks, Lecadre, for painting a picture that pulls me in, and down. Now, I’m going to bed. One of the most immediate responses I’ve ever had to a work of art was a Morris Louis painting. These canvases are not really painted as much as they are stained. He was inspired by another painter—Helen Frankenthaler—who was applying very thin paint to unprimed canvas so that the paint actually seeped into the fabric. Louis also used thin paint, but he would let the paint run down the canvases, sometimes controlling the direction of the flow, sometimes not. The paint blended as he poured layer after layer creating these “veils” of liquid color. The paintings are big. Unless you’re in a very large gallery and are able to stand way back, the paintings are imposing. Your frame of vision is filled with the streaming color. So, one day I was walking through a museum and I came across a Louis painting that stopped me in my tracks. I turned to face it and was immediately overcome. It felt like the painting came off the wall and hovered there in front of me. The streams of color seemed to be pouring over me and seeping into my pores. I don’t think I’ve ever had such a visceral experience with a painting, but it was a mystical experience too. I believe in the sacramental principle which holds that everything has the potential to be a vehicle of God’s grace. The catch is: you have to be on the lookout for it. Most of the time, I do not have my eyes open, but every once in a while—like standing in front of that Louis painting—God reveals his grace in dramatic fashion. That day in the museum, the grace was the reality of his presence flowing over me, seeping into my soul, soaking me through and through. As I turned to walk away, I wanted to wrap that canvas around my whole body and so carry that experience with me right out of the building. I didn’t need to, though. I feel it even now when I see the painting. I guess I’m stained too, but in a good way.